I bid adieu, or rather au revoir to White Morning, our home these last eight days. It’s a windy grey morning near the harbour. 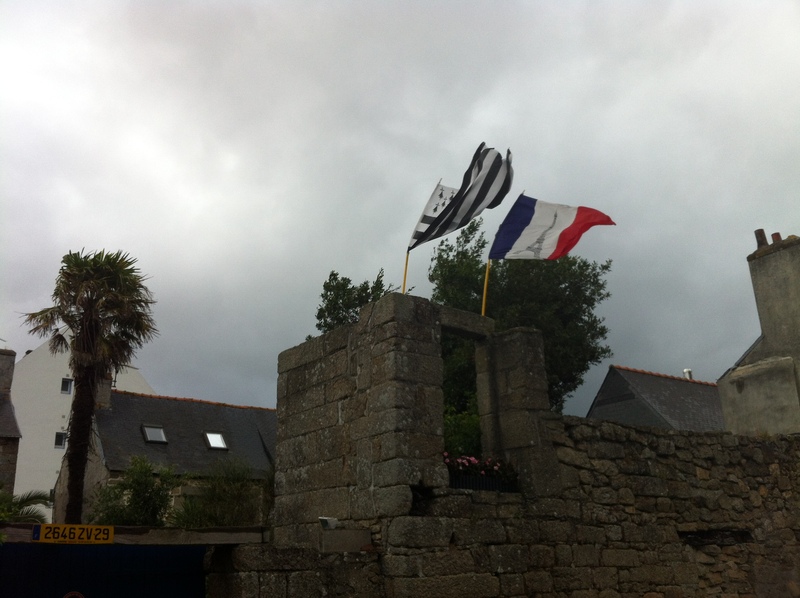 The France and Breton flag snap and flap madly in the wind. 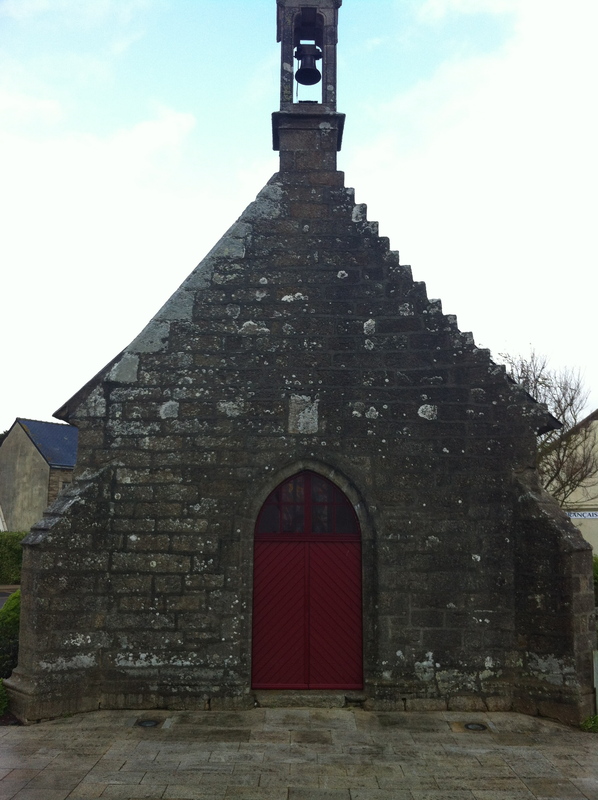 To say goodbye to Concarneau, our base the last 4 days, I pay a quick farewell visit to this tiny mariners’ chapel. 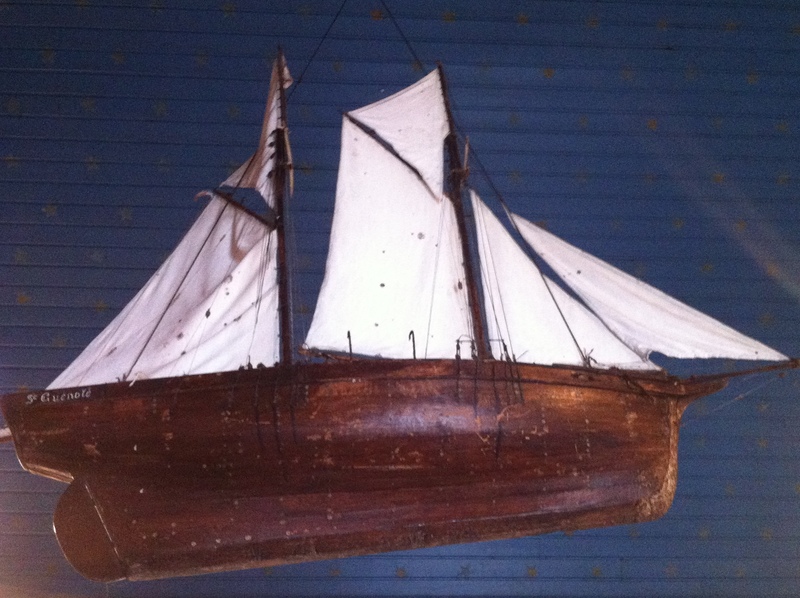 This was the landmark on our arrival, on our charts, which we used as a beacon and which guided us safely into port. It seems apt to pay a final visit now and give a little prayer of thanks. 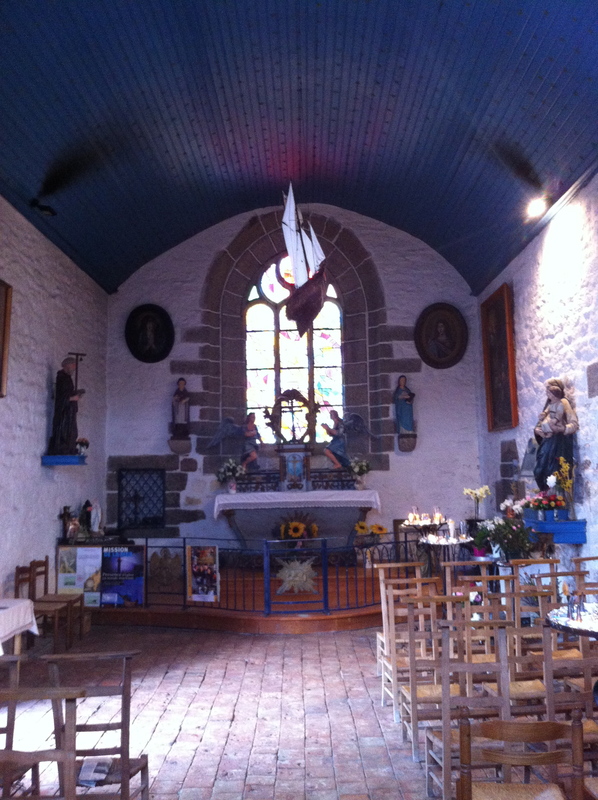 We drive out of Concarneau. The weather improves even as Mike drops me to the station. 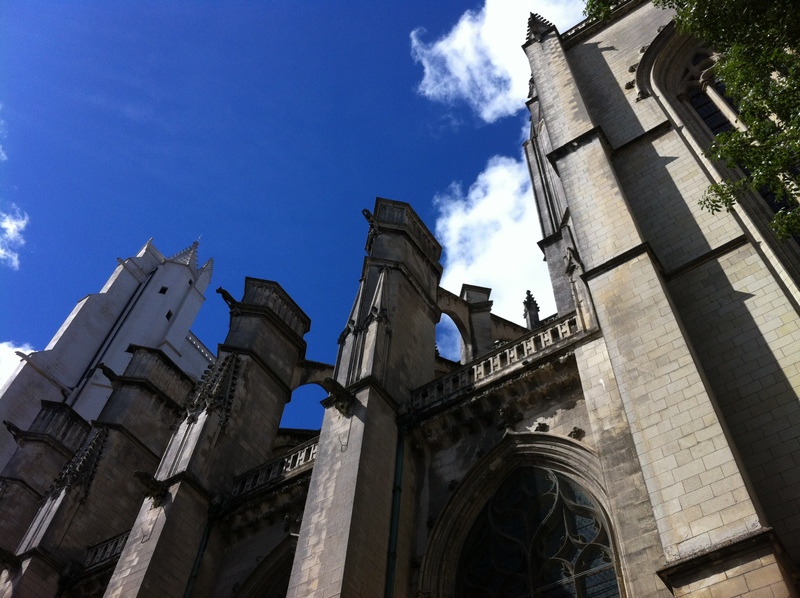 From there I take the train to Nantes, a 90- minute trip. By the time I arrive it’s turned to a beautiful early afternoon. I don’t really know what to expect from Nantes. 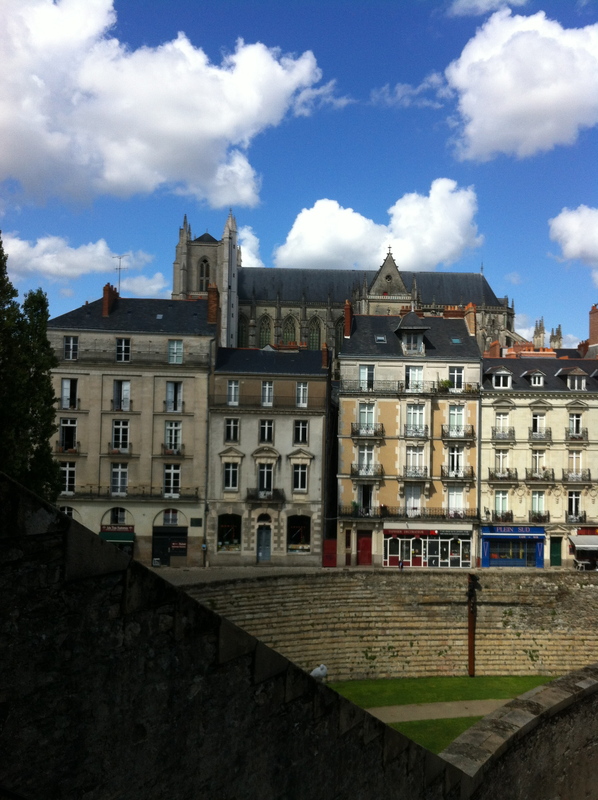 My image of NW French cities is founded on complete ignorance, what few metal pictures I have are of bad weather and dull industry, car plants instead of vineyards; cider and muddy football instead of champagne rugby, beer and crème fraiche instead of olive oil and wine. I am not expecting an especially elegant or beautiful city. Well, my ignorance is badly shown up. How wrong could I be? Nantes turns out to be a pearl. Part of the reason lies in its status as a former capital. 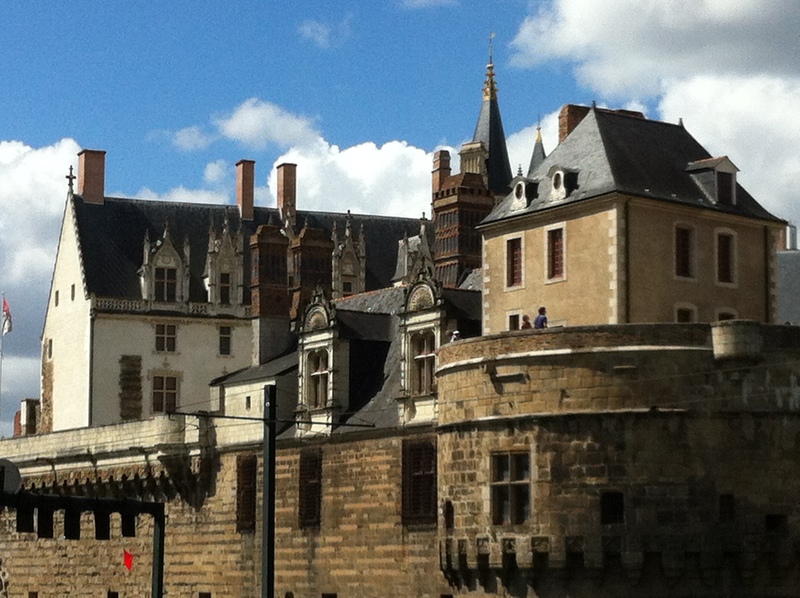 Like Navarre and some other ancient regions of France, Brittany used to be an independent Dukedom with Nantes its capital. So the splendor of the city reflects this. The Chateau is actually a former Palace. Likewise, in late medieval and early Renaissance eras, the cathedral (in the distance below), was the main place of worship for the entire, wealthy, highly sophisticated state, something fully reflected in the scale and ambition of the building and artworks- I think you’ll agree. 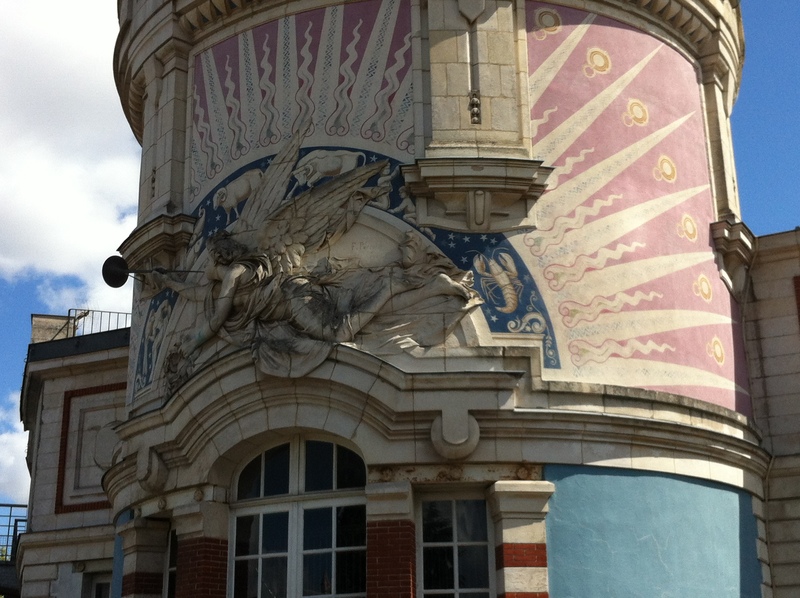 Even before make it into the historic centre, I get distracted a 19th century construction standing over a bridge, specifically by this mad- looking wedding cake of a building, replete with astrological symbols. 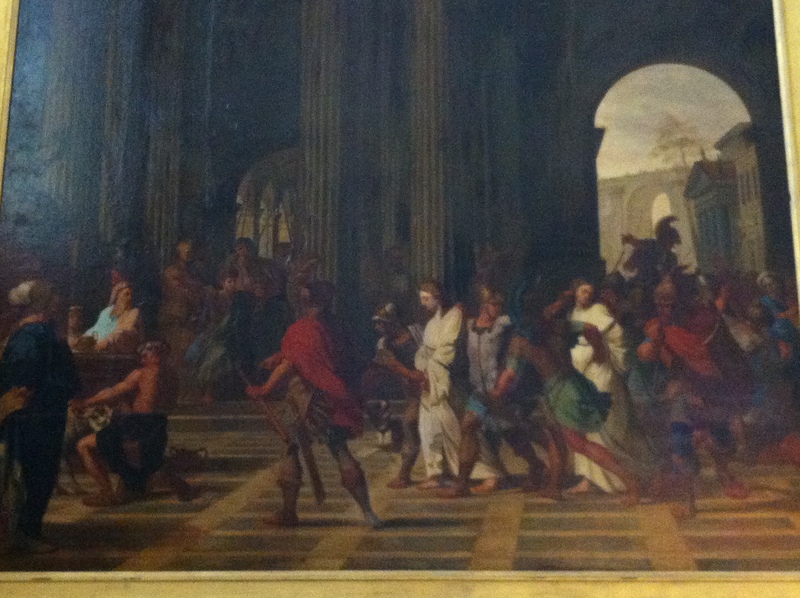 Look at the trumpeter bowing his horn, Apollo the sun God perhaps? I like the way his trumpet is of real bronze and protrudes from the building. It makes it more real somehow. You almost expect to hear it sing. 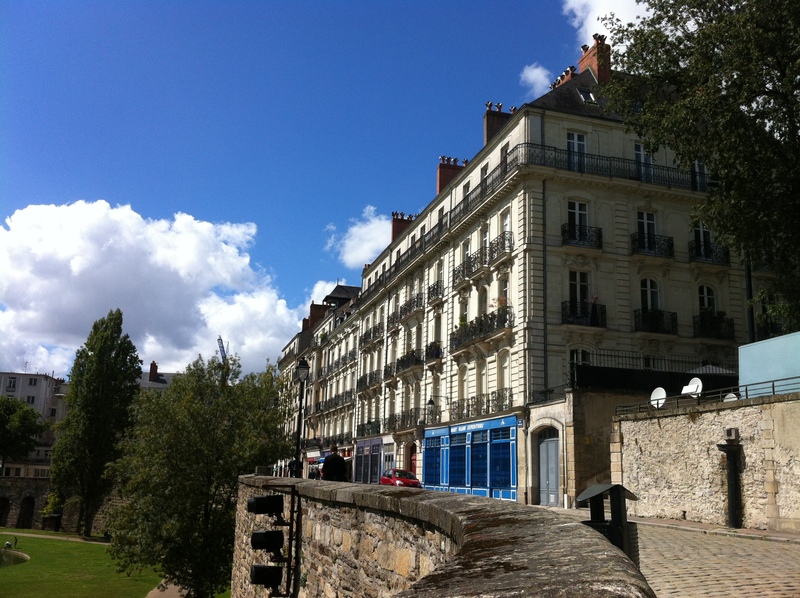 Next is a quick visit to the chateau, approached via this lovely elevated terrace of 18th century houses. What a wonderful place to live, one of these fine city maisons would be. Immagine the mornings, sipping your cafe and nibbling your croissant on one of these balconies, looking over the place beyond, with some half-finished masterpiece on the easel behind you probably, and your lover stretched out in bed perhaps. Okay, am i getting carried away? There isn’t really time to do justice to the Palace/Chateau. 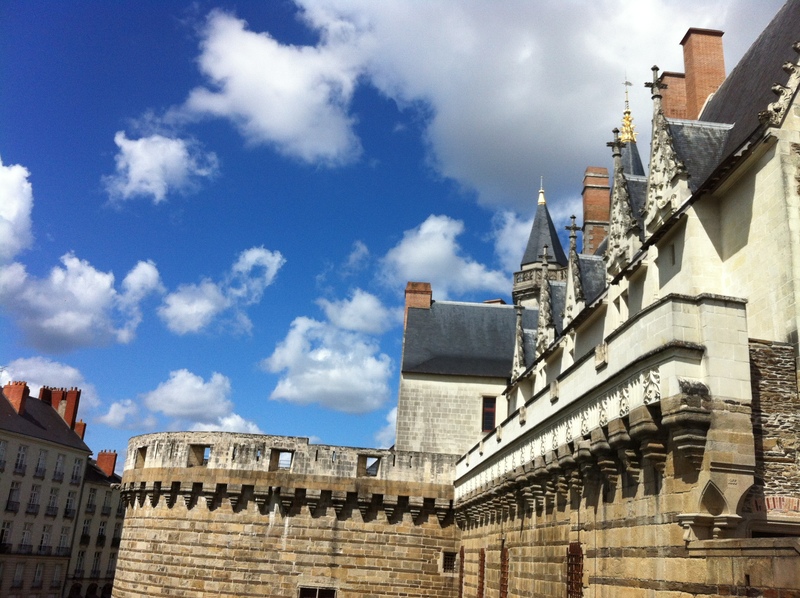 There is a series of museums here, and some very looking exhibitions, including one dedicated to shipwrecks and disasters from Brittany’s long maritime tradition, and another exhibition dedicated to the odious slave trade, of which this city, lamentably, was once a centre. But there’s not enough time and there’s so much else to see. I spend most of my time here on the ramparts, the line of high defensive walls surrounding the complex. 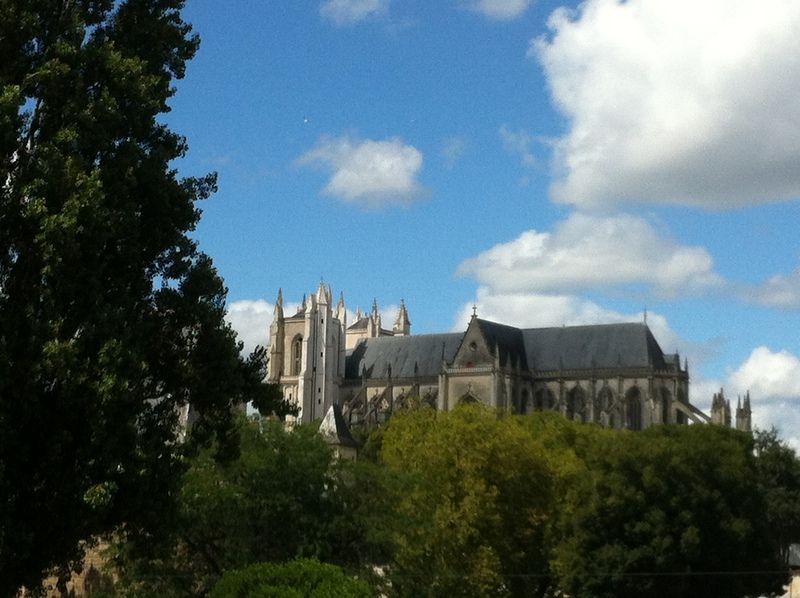 I’m constantly distracted by distant views of the cathedral, (looming up behind the same terrace, now below me). Before long I am hotfooting through the streets behind in that direction. 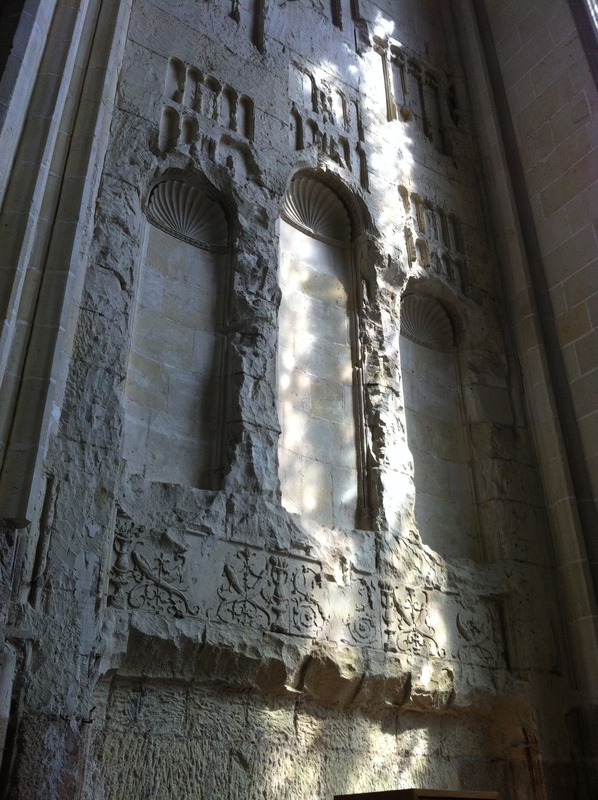 The cathedral, predictably, is amazing. 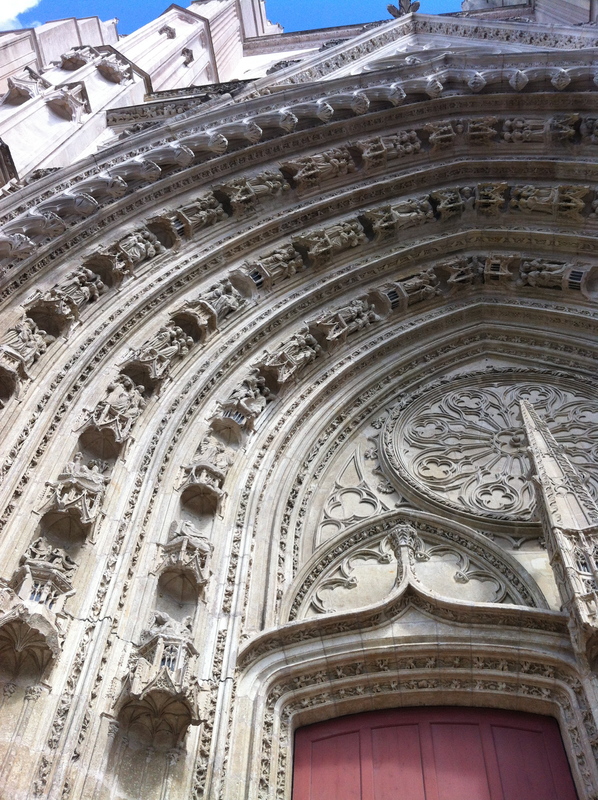 High buttresses; beautiful exterior sculpted decoration, high arched doorways. 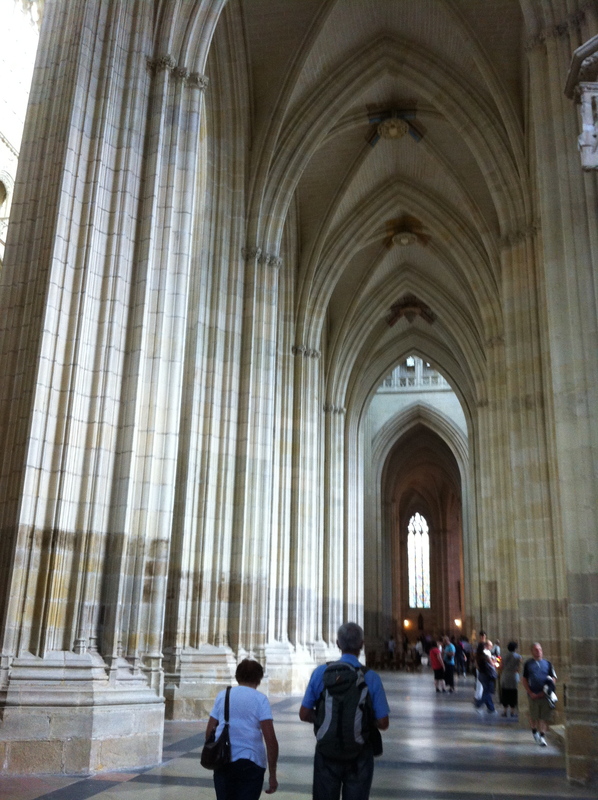 Inside is vast, under this huge, soaring vaulted ceiling, another masterpiece of medievel high Gothic engineering and art. The quality of work is stunning. This is France after all. 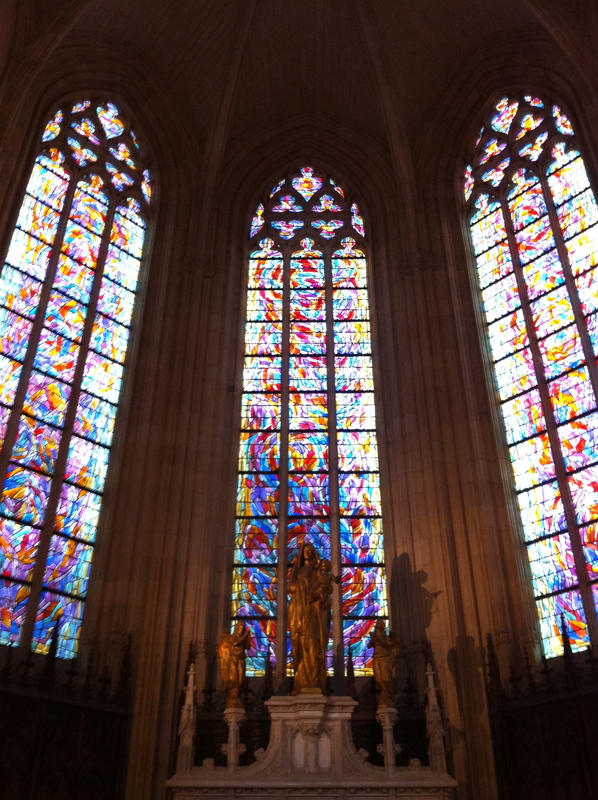 The stained glass windows are very nice, but I notice they don’t look very medieval. 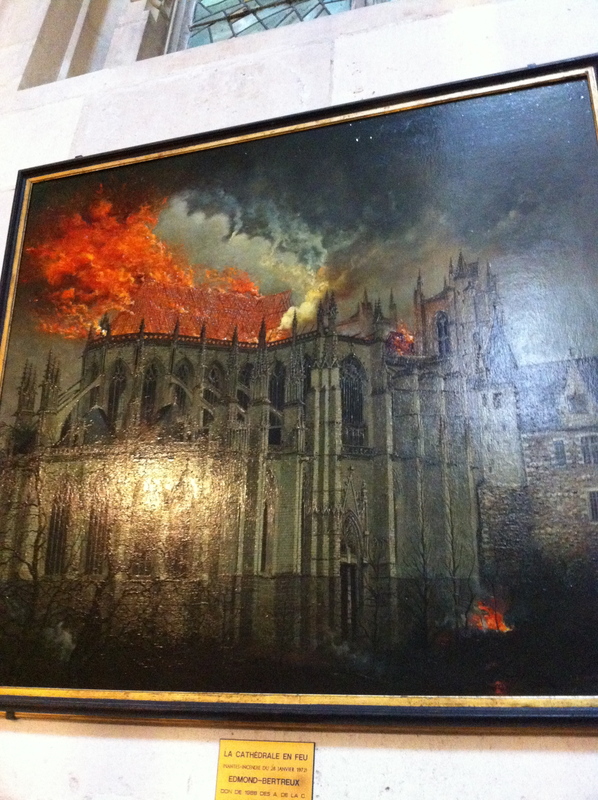 Sure enough the cathedral took an absolute battering during the 20h century. First it was bombed by the Allies in 1942. (well done Allies, good work, but be more careful next time) and then even worse, suffered a huge fire in 1972. Would you believe this oil painting, below, dates from after 1972? 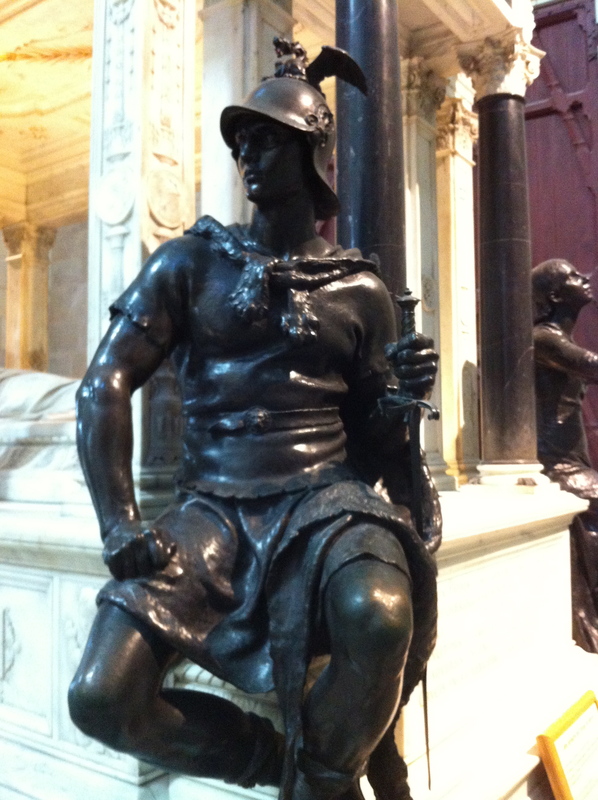 Obviously the male, Mars-like figure represents his martial prowess, the female one his time as governor of areas in both europe and africa, you see how she nurses the european and african children. I have no idea if ths acurately reflects his record, pure propaganda perhaps, but I did like them simply as artworks. 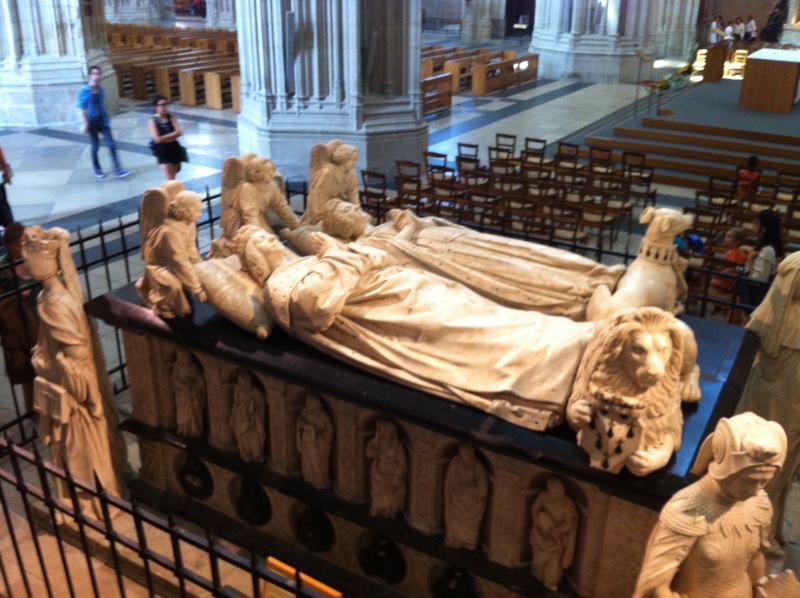 But, among the cathedral’s funerary and memorial sculpture, the undoubted tour de force is this jaw-dropping tomb to the Duke Francois II, last male ruler of an independent Brittany, and his wife Margirite de Fois. He spent most of his reign fighting wars with France to protect that independence. 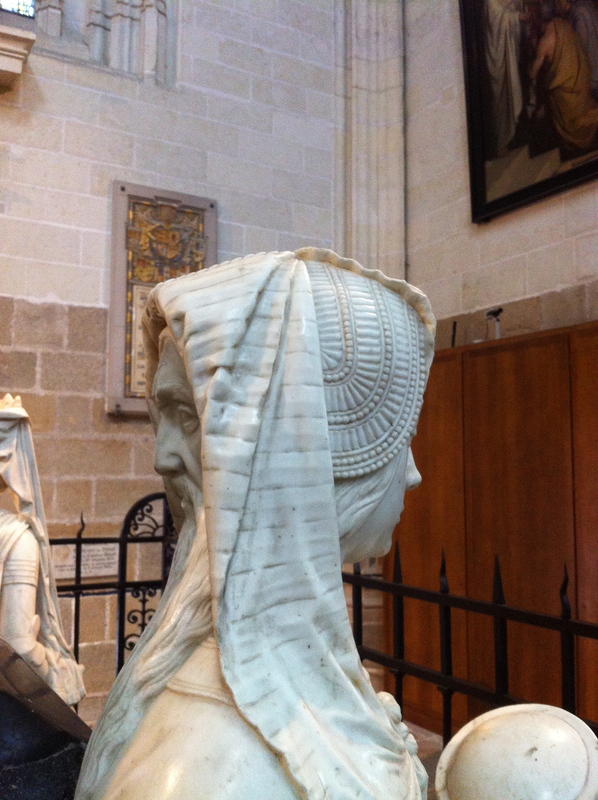 Their daughter, Anne of Brittany then became ruler in her own right. 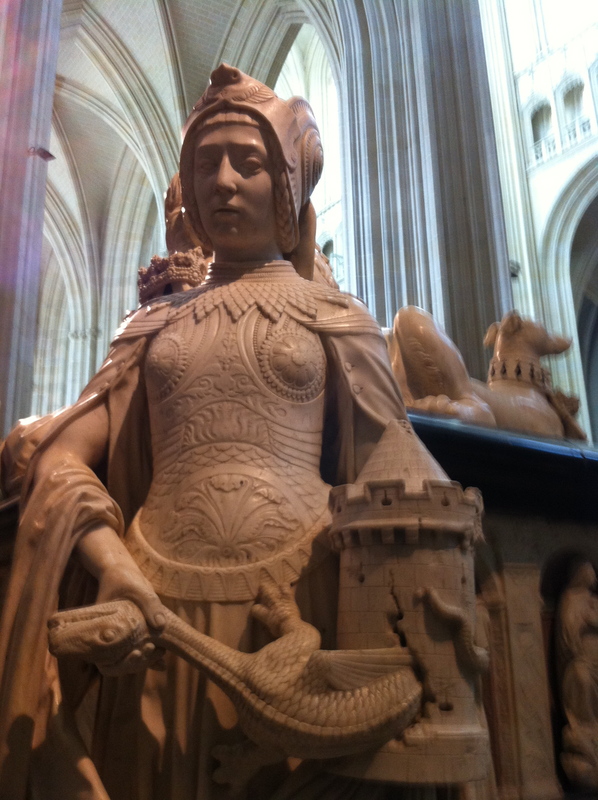 She, Anne also married, not one, but two kings of France, becoming both Queen of France (twice) and, simultaneously, the Duchess-sovereign of Brittany. Her son in turn thus became ruler of both states. This personal joining of roles paved the way for the eventual union of the two states in 1547. 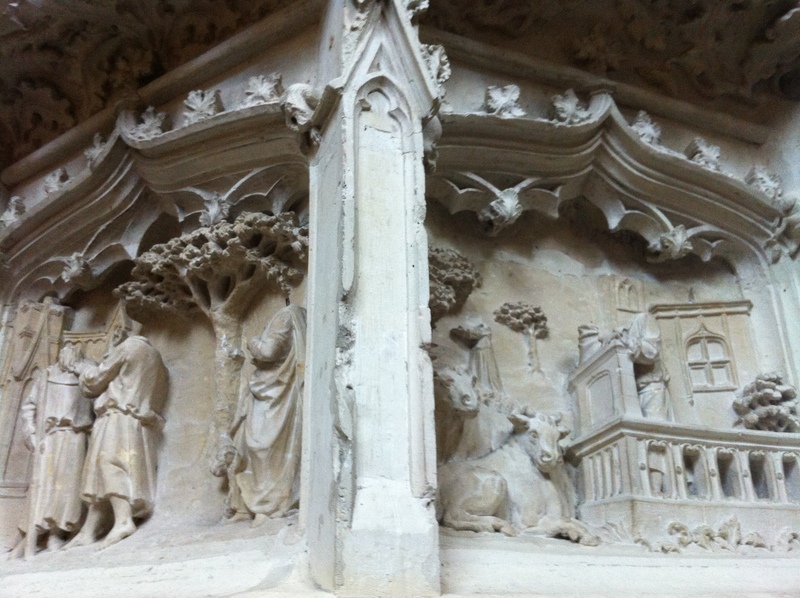 Anne commissioned this tomb to her father, and perhaps had a hand in its design. 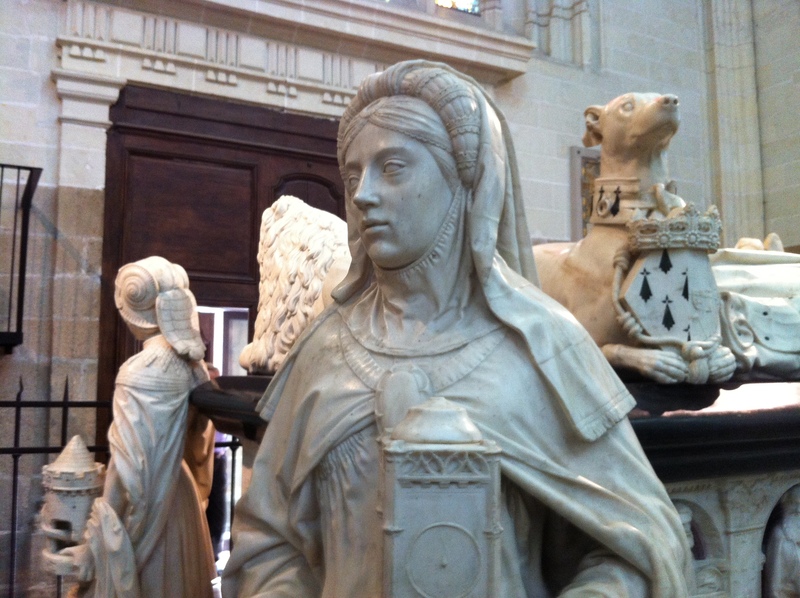 The artist sculptor who created it between 1502-1507 was Michel Colombe. He was 75 when he completed it, an amazingly advanced age for that time. Look at the quality of his work; it is dazzling. 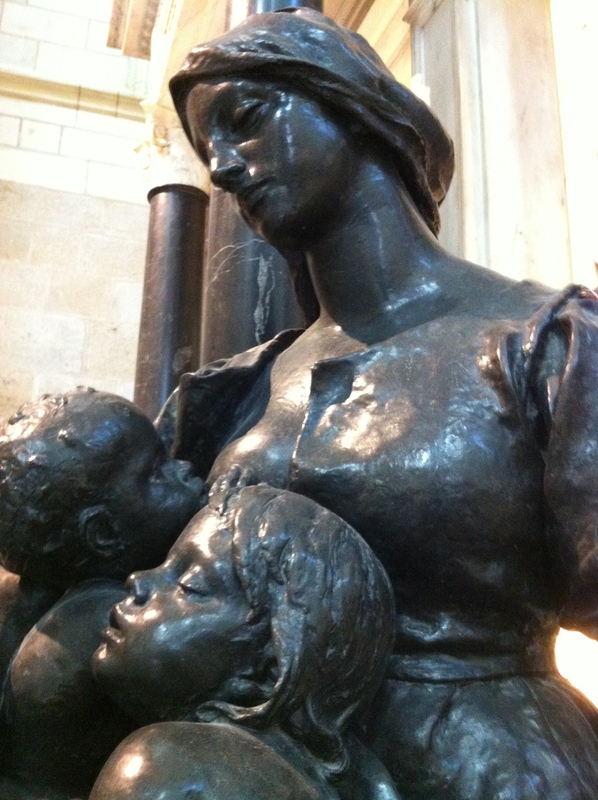 The series of four life-sized allegorical statues are especially intriguing. 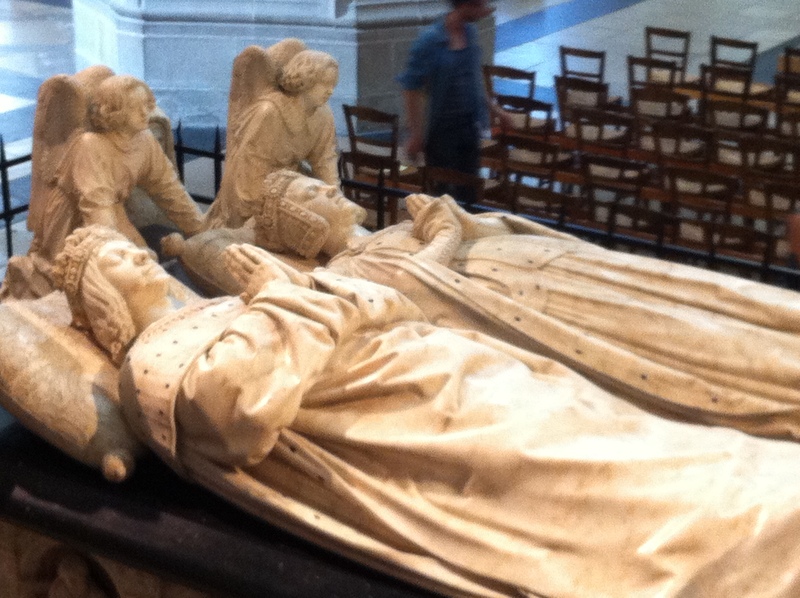 They represent four of François’ different Ducal virtues as ruler, fortitude, wisdom and the like. 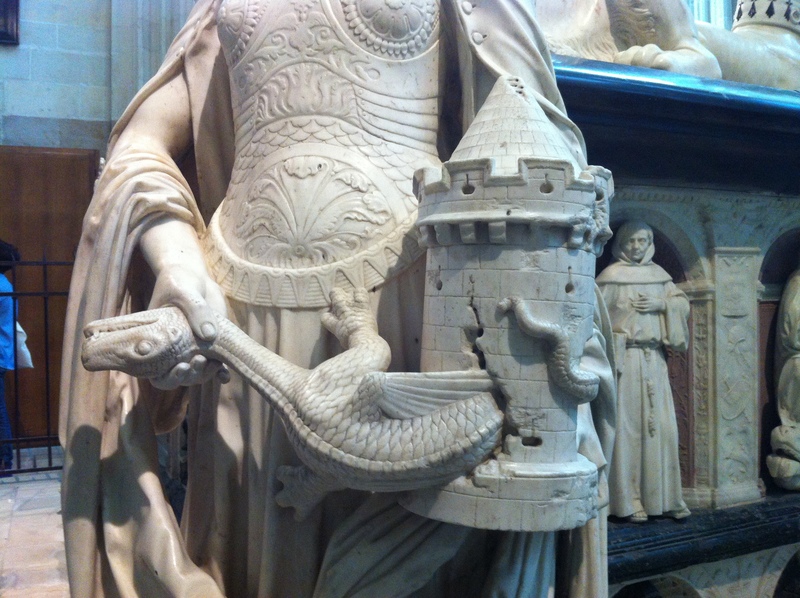 The statue representing Fortitude holds a casket model of a castle-fortress in her hands. A serpent has attacked, but she calmly throttles the slithery monster. The statue representing wisdom is depicted as a beautiful young woman, as is the usual convention with these allegorical pieces. But look, at the back of her headwear. Do you see the old man’s face? It looks a little sinister I think, but was not intended as such. More to do with “an old head (wisdom) on young shoulders” as i understand it. Apart from nearly missing my flight, the rest of my trip home is uneventful. The flight is nearly 2 hours duration, but with the time difference we get back to Dublin by 7.30 local. My 12-day, Ireland-Wales- England-France-Ireland sailing trip, round-the coasts journey of one ferry, three trains, 1 yacht, 1 hire car and 1 flight is almost done. Only the airport bus home now. But this is Dublin. There’s an absurd wait for the airport coach. But it doesn’t matter anymore. I had a great holiday. 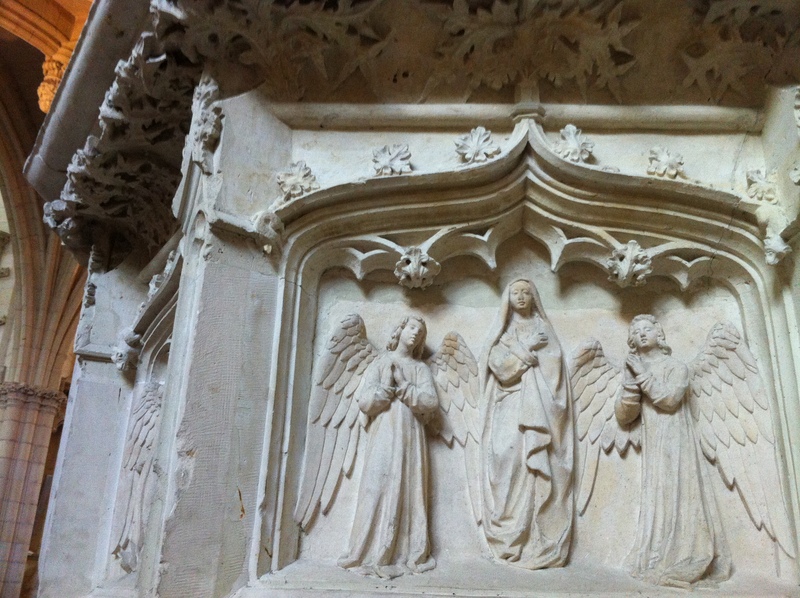 I saw tons of wonderful things, art works medieval cities and churches, Neolithic stone circles and the like. I ate a lot of delicious innocent sea creature and shellfish. True, I had a mild bout of food poisoning. But even that turned into a bonus, as I lost a ton of weight. I also have a tan. Frankly I look fantastic. We are all safe and now I am home! I stand outside the terminal and chat to the Australian who was so kind to me when I was late and stressed getting on the flight back in France. It turns out he is a musician, on a European journey and now he’s here, looking for his Irish roots. Even on the hideous forecourt outside the old terminal, under the grey Dublin skies, the air is somehow full of Bonhomie. It was the perfect holiday. I feel refreshed and revived. It’s good to be home. Thanks to al the loyal readers who stuck with me through the whole dam saga. It was great to have someone to show my pictures and tell my stories to. Thank you for reading. I’ll start posting again in few weeks again and hopefully get back to Hidden Dublin stuff. I hope you’ll join me for that. (Oh, and welcome home. I am longing for home, very much so, myself). thank you for reading the posts Angela, and for all the kind words over the last few week. I’m not surprised you’re longing for home, China is a long way away to be, and such a different culture. Very impressed ny your adventures. Enjoy the rest of your stay, when are you heading home? I actually travel with large bin liners as well (we call them “garbage bags” but “bin liners” sound so much less icky). They’ve come in handy many times. Thanks for taking us along on your trip—it was gorgeous. Glad you arrived home safe and sound. Garbage bags or Bin Liners: – either way, I’m delighted to discover a kindred spirit! Yes, they really are the indispensable travel item, to repair your bag, dry-line your tent, even save your life at sea. And if all that fails, we can revert to using them to collect our rubbish. It’s win-win I reckon. Thank you for reading and for all the nice comments M. Weebles, been great to have your company. Great tip with the bin liner! I think I’d have just sobbed in a heap and/or attempted to put on all my clothes rather than lose them forever. I did – in the extreme circumstances- consider that option! But I’d come equipped for all weathers. you wouldn’t believe the amount of clothes and heavy sailing layers I had. Even if there’d been time, and I’d avoided a heat collapse, I’d have been completely spherical. Never would have squeezed onto he flight, literally ! Wow, so many great pictures! Reading this article I feel like being there as well. Thank you! By the way Dina and me will visit Dublin in a fortnight 🙂 for ten days. We are very much looking forward to it. thanks for all those pictures. Is like being there as well. By the way, Dina and me will visit Dublin in about a fortnight for ten days. We are very much looking forward to it 🙂 I will celebrate my birthday there. Many, many thanks for your generous words Klausbernd, I am delighted you enjoyed it all, I certainly felt like I had a great trip and I learnt a lot. Hope you have a wonderful trip to, and birthday in, Dublin. If the weather is bright and dry and clear, adn you feel like gettimg out of the city centre for a day trip, I recommend long walks along Dun Laoghaire’s east pier, and then on, through the lovely old-fashioned, coastal suburbs of Sandycove and onto Dalkey. Very best regards- Arran. 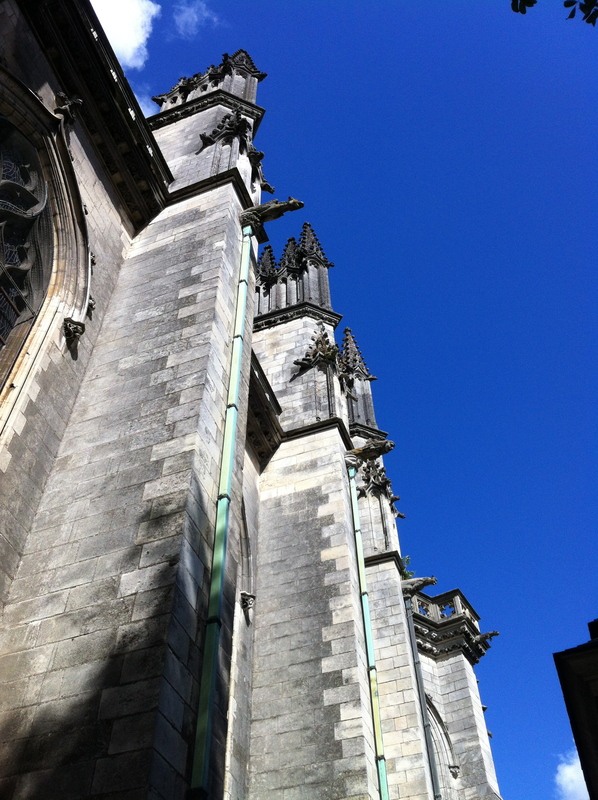 Arran, you make me regret not having gone to the Cathédrale Saint-Pierre-et-Saint-Paul de Nantes. 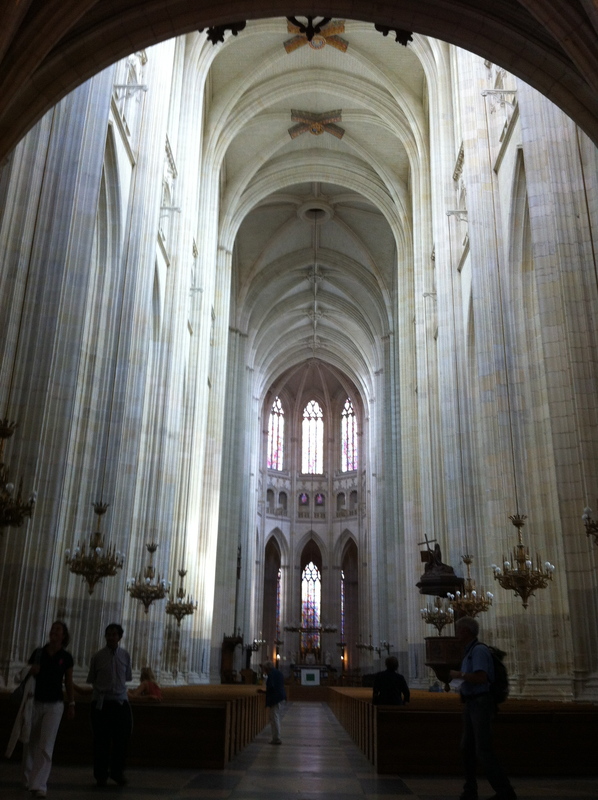 Your shot of the soaring nave makes me salivate with anticipation. 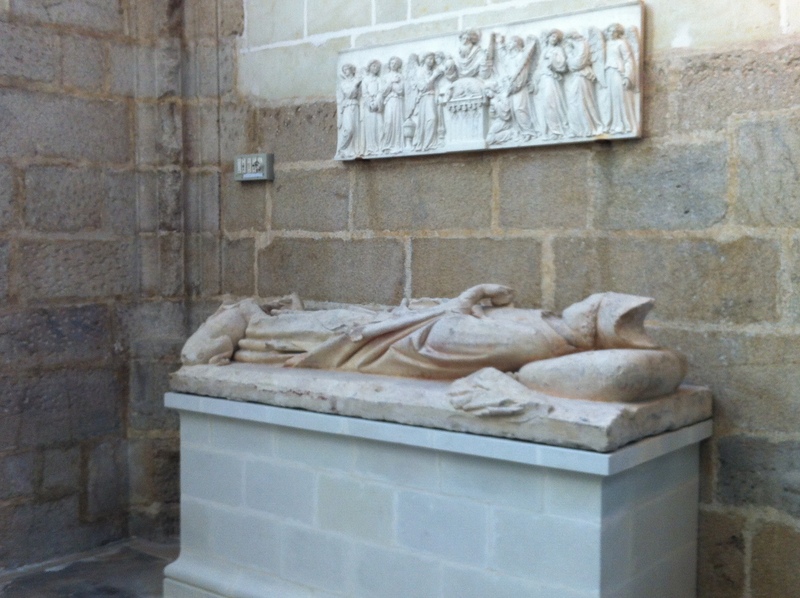 Hi Dennis, yes I agree, it’s an extraordinary place, and I think that tomb to the last Duke-sovereign and his wife Margerite is also astonishing. 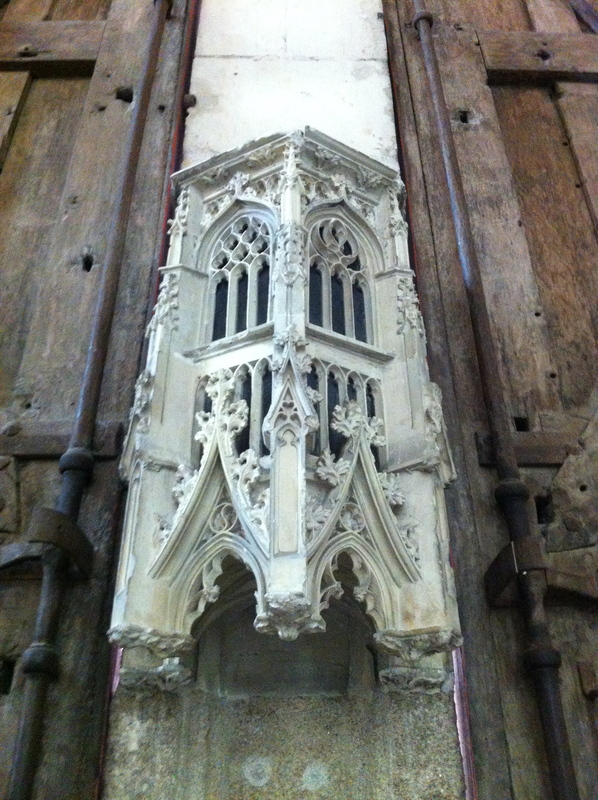 I was agog with the scale, the grander and sheer quality of the work overall. It is often thus in France. Not surprised you and JP love spending so much time there. I hope to do much the same in future years, it is a wonderful country. 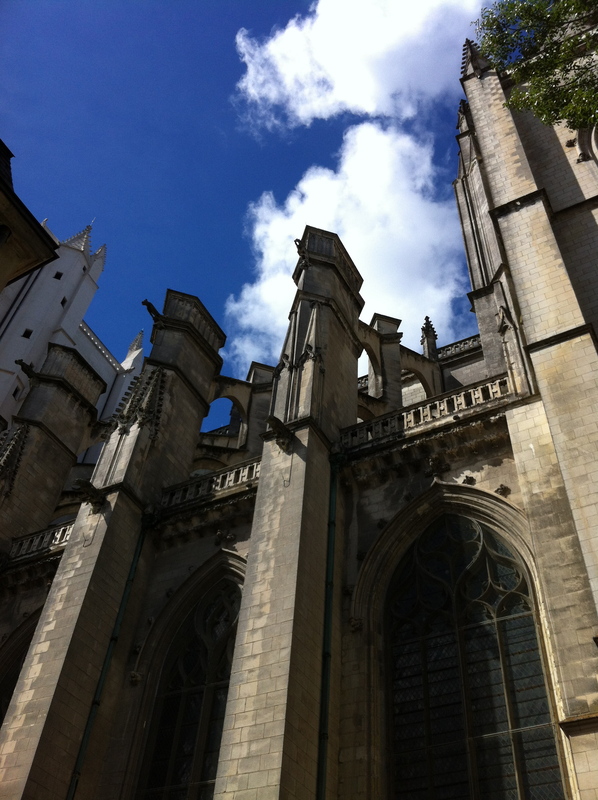 Previous Post Pont Aven Washout & the Cathedral and the Bridges of Quimper. Next Post Saint Patrick’s Cathedral, my favourite place in the world.